In this Post: When you clear your space, you free your mind to accomplish bigger and better. 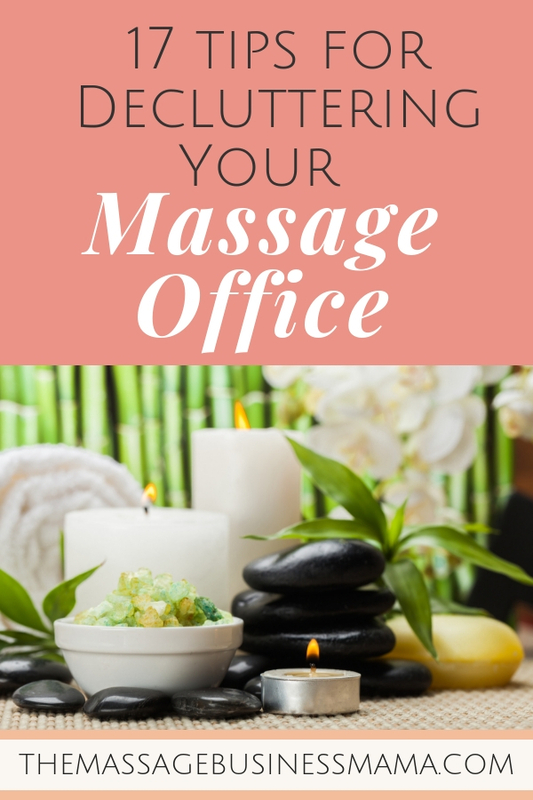 Learn 17 tips for decluttering your massage office to help your business thrive! Ever notice how much better you feel and easier it is to get things done when you have a clean house? Decluttering is all the rage right now! Guess what, that is for good reason – because you feel better in a decluttered space! The act of decluttering doesn’t have to stop with your home. Decluttering your massage office can open up doors of abundance and prosperity, as well as make you feel really good! By making a point to declutter your massage office, you will allow yourself to have a more free, less burdened mind. Which in turn will help you to be more creative, accomplish more, and attract more clients. When you are disorganized and cluttered, everything competes for your attention. This type of chaos makes it hard to work and thrive. It also influences perceptions of your professionalism. I don’t know about you, but I am always trying hard to keep a high level of professionalism present in my massage environment! When you have a more clear mind, you can focus your attention on more creative endeavors. Endeavors that help you expand your potential. Endeavors that allow you to prosper and grow. Let’s all strive to prosper and grow our massage businesses and our lives. While it may seem like a daunting task to organize your office, especially if you have neglected it for some time, decluttering doesn’t have to be a huge burdensome task. If you start with small steps and stay consistent, you will quickly begin to see results – small steps daily, over time compound. Make changes every day to the way you process and treat your space and decluttering will come naturally. With these changes, you will become more inspired and open to the flow of abundance in your business. A little bit each day goes a long way! You don’t have to do it all at once. Ten minutes a day can almost be better than taking an entire weekend to completely overhaul your office. The method of a few minutes each day is a more sustainable approach to tackling your clutter problem than binging on cleaning for a few solid days. By doing it in small increments, you get into a habit that will help you maintain progress over the long haul. Start from scratch. 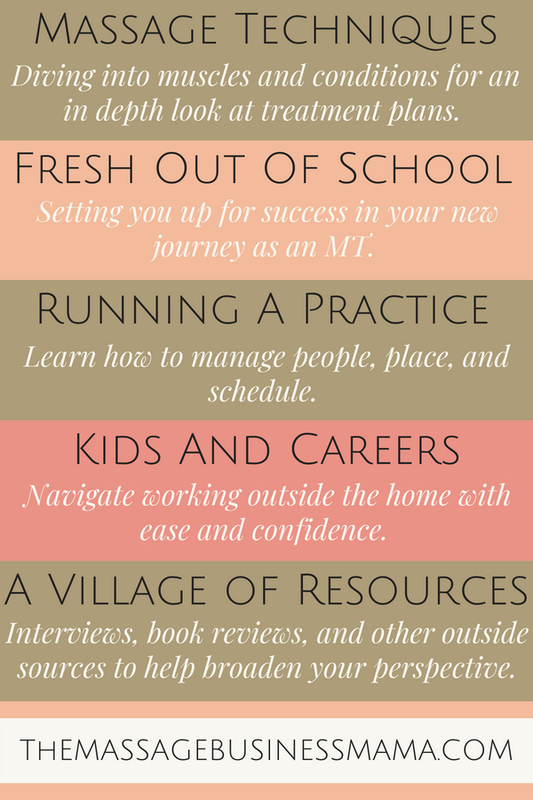 Have you tried multiple times to declutter but been unsuccessful? Maybe you need a new approach. Maybe instead of removing things bit by bit, you need to try to start from scratch. Collect everything from your office and put those items in boxes. Then go back to work. When you need an item, pull it out of the box. If you find that after a few weeks you still haven’t needed an item, chances are good you can get rid of it. No more paper clutter. Do you have heaps of old client intake forms? Create a system for uploading these documents onto your computer. Some online booking systems have places designated to store these files. Better yet start having your clients file out their intake forms online. Programs like Quicker Notes and Guest Intake are designed specifically to eliminate the hassles associated with paper intakes. CDs are so old-school! Are you still using CDs for music? Consider switching to an iPod or other music playing device. Careful with Spotify and Pandora as they do have rules associated with using music in a business environment. It is possible to use them for business purposes you just need to have the correct plan, so do your homework. Clean out the linens. If you have sheets or towels with rips or tares, get rid of them! Not only are they reflecting poorly on your business, they are also cluttering your space. Often local animal shelters will happily take your worn out sheets and towels to use for the animals. Pitch the magazines. Do you have magazines for your clients to browse in your waiting room? Get rid of them. People have phones to entertain them. They don’t need last years People magazine! Use baskets to hide the rest. I have a giant wall in my office with baskets, for cleaning supplies, my therapist’s personal items, and sheets and towels. Obviously, it is impossible to have no miscellaneous items in your massage space. For these such items, baskets make a great visually appealing hiding spot. Just make sure to go through these baskets from time to time to make sure things aren’t accumulating. Are your walls cluttered? Reassess what you have hanging on your walls and consider taking down some of your pictures to free up space for better mental clarity. You will be amazed how a little white space clears your mind, especially if it has been a while since you have had this kind of blank slate. Designate a donation space. Have a spot designated for donation or giveaway. That way as you come upon items you are ready to part with you will know exactly where to put them until you have time to drop them off at the thrift store. Clean out the fridge. Toss salad dressings from 2010, pitch the old leftovers, and scrub the shelves of your fridge from time to time. Reduce furniture. I am always collecting hand me down furniture, end tables, chairs, and bookshelves that people are getting rid of. But guess what, there is a reason people are getting rid of them. While it may seem like these type of items will come in useful in your massage space, if they don’t quite fit as you envisioned, don’t be shy to rehome them. Review processes and procedures to simplify them. Recently we simplified our procedures around processing our intake forms. For each client that comes in, they are sent a mailer. In the past, this mailer has included a rack card, two business cards, and a one-page welcome letter. We are currently consolidating this into one postcard. This saves us on postage, envelopes, rack cards, business cards, paper, and ink. All of which take up a fair amount of space, time, and money. Without taking the time to review our processes and procedures we could continue to clutter our minds, time, and space with excess. Instead, we choose to continually look for ways to simplify. Make sure everything has a place or home. When your items all have a home, it makes it so much easier to tidy up then when you are continually searching for a spot to store an item. Finish products. Use up the last bit of lotions, essentials oils, and creams before opening a new bottle. I am notorious for almost using up a product. It will then sit in my junk basket for months, if not years, never to be seen from again. Make a point to use up these products before moving on to your next favorite potion. Stop the inflow. Be conscious about what you bring into your sacred massage space in the first place, this way you don’t have to spend so much time purging this excess. Know that sometimes it gets worse before it gets better. A perfect example, the junk drawer. In the junk drawer, you have all your miscellaneous items. It’s easy to let this drawer become packed with all your excess bits and treasures. They are contained and out of sight. In order to clear out this drawer of unneeded items, you will need to dump out the contents of the drawer, sort through the mess, and then return items that still seem useful. When you dump out the drawer, you are creating a bigger mess. That is you are creating a bigger mess in the short run. If you can take a step back, you will see how happy you will be knowing exactly what resides in a given drawer. With this in mind, the short term mess doesn’t seem like such a big deal! Energetically clear your space. Once you have gotten to a pretty good place with your decluttering efforts, you may want to consider clearing your space energetically. You may want to smudge with sage as Native Americans did to clear negative energy and bless the space for the future or diffuse essential oil. One of my favorite oils to diffuse after a time of cleansing is the Young Living blend, Magnify Your Purpose. Learning to have a clutter-free office is a habit, and habits take time to develop. This type of process is not a quick sprint to the finish line. It is also not a marathon. Instead, it is about developing new routines that you can implement into your daily routines. Coming into the office ten minutes early, or staying ten minutes late gives you the time to keep things kept and tidy, which will allow your mind room to thrive.